Author’s Note: In the middle of the 19th century, Lyman Copeland Draper roamed the documents on early frontier history. One of his favorite subjects was Daniel Boone, the man who so long has personified the frontier. Since Boone was poorly educated he wrote few letters, but his relatives and friends were still living at the time Draper was amassing his materials. From them Draper collected a wealth of information which went into his “Life of Boone,” a biography which was never finished and thus has remained unpublished. Draper’s “Life of Boone” would have been the definitive work on this outstanding American. In the 20th Century other authors have written about Boone and all of them have used Draper’s story to a great extent. His work deserves to he published. The manuscript, along with other Draper materials, is owned by the Wisconsin Historical Society and is available on microfilm. Unfortunately the handwritten manuscript is extremely difficult to read. This transcription will, hopefully, make the biography more widely available, fill in a few gaps of Paul A. W. Wallace’s excellent book “Daniel Boone in Pennsylvania”, and allow the reader to glimpse a view of eastern Pennsylvania in a simpler day. The story, as transcribed here with a few editorial changes, begins with the ancestors of Boone. Boone’s Ancestry, Birth, Childhood with Boyish Anecdotes. In May 1769, Daniel Boone, an obscure individual on the western confines of Carolina, started to wander through the wilderness of America in quest of the country of “Kentucke.” This, in his own expressive language, was the object in view and herein commenced his great mission of western exploration and adventure. To Boone this passion was uncontrollable but there was a Providence in it; if indeed he did nor see it, then he would come to realize it later. That fair land Kentucky the land of promise then reposed in the quiet of its primeval beauty and grandeur. The buffalo, elk, bear, deer and other wild game roamed everywhere. It was a hunter’s paradise. But in all this charming region the habitation of a white man was nowhere visible; no ruthless axe had yet invaded this land of forests and green meads. When in 1792 Kentucky became a member of the American Republic, it was inhabited by over a million happy, peaceful people. Who was this “humble instrument” ordained to settle some of the fairest portions of the New World? He was Daniel Boone no ordinary man the pioneer of Kentucky. Several persons bearing the name “Boone” were among early settlers of the British colonies. Nearly all were from England although Henry Boone (or DeBone) was of French origin. The Boones of Maryland became extensive and soon migrated to New Jersey and Pennsylvania. It is recorded in a newspaper of that day that Robert Boone, an honest and industrious planter, died of old age, Feb. 9, 1759, at his plantation on the north side of the Severn, near Annapolis, Md., on the very place where he was born in 1680 and from which he never wandered for more than 30 miles during his entire lifetime. He left a widow to whom he had been wed for 57 years. Thomas Boone, probably a native of England, was appointed royal governor of New Jersey in 1760 and the following year transferred to the government of South Carolina. In 1769 he returned to England where he was named a commissioner of customs. He remained in England when the Revolutionary War began. There were numerous Boones in America and the earliest ancestor of Daniel, to our knowledge, was George Boone, a native of England, who had a son of the same name born in the city of Exeter, Devonshire. The second George Boone, a blacksmith by trade, was married to Miss Sarah Uffey and their son, George, was born at the village of Stoak, near the city of Exeter, in 1666. He learned the trade of weaver. The latter George married Mary Maugridge who was three years his junior and they had nine children: George, Sarah, Squire, Mary, John, Joseph, Benjamin, James, and Samuel. All except John married and many descendants remained. Squire Boone was the father of Colonel Daniel Boone (the second son and third child of George and Mary Boone). Squire was born on the “fourth day of the week, between eleven and twelve in the forenoon of the 25th of November 1696.” Like his father, he was a weaver but he had the wanderlust. In 1717 George, Sarah and Squire Boone went to Pennsylvania at the insistence of their parents to personally inspect the prospects and inducements for the permanent settlement of the family in that flourishing province. The exploratory visit came between 1712 and 1714. Old George Boone and Mary had embraced the faith of the Society of Friends (Quakers) and were increasingly turning their attention to Sir William Penn’s inviting colony located in America’s wilderness. The hope of bettering their own and children’s lives in the New World were inspiring them. With a favorable report, George Boone returned to England leaving Squire and Sarah in Pennsylvania. Preparations then began to take the family to America’s distant shores. George Boone never hesitated in the endeavor. They left England on Aug. 17, 1717, and landed in Philadelphia on Oct. 10th. They first lived in Abington, now Montgomery County, some 14 miles north of Philadelphia. This settlement was composed almost entirely of Quakers with Robert Fletcher, a noted public figure, residing there. From here George moved to a small hamlet of North Wales in Gwynedd Township, a few miles from present-day Abington. Originally settled by the Welsh, Gwynedd also had two Quaker families residing there. Sir William Penn was said to have visited this community around 1700. During this same period Sarah Boone married Jacob Stover, a German of much character, who settled in Oley Township, then part of Philadelphia County. This brought George Boone to Oley and he was so pleased he took out a warrant in 1718 for 400 acres of land, and most likely relocated his family there the following year. Among his worthy neighbors was Arthur Lee, a native of England, and also a Quaker. Some of the family’s nearest neighbors were Indians who delighted in having the benevolent families in their country. Neither Lee nor Boone were ever molested by Indians. First George Boone erected a cabin and in 1733 built a more spacious house occupied by son James. George Boone and his wife, Mary are buried in the Friend’s burial ground in Exeter. While in Gwynedd, Squire Boone met Sarah Morgan, descendant of the celebrated Gen. Daniel Morgan of the Revolution. Both were Quakers and on the 6th day of May 1720, they declared to the Gwynedd Meeting their intention to marry. They were married July 23rd. Near the close of 1730, Squire Boone obtained a grant of 250 acres of land, situated in Oley, now Exeter Township, about a mile above the confluence of the Owatin Creek with the Monocacy. He began weaving and farming and gradually accumulated enough money to purchase a home in Oley where land was moderately priced. With the help of relatives and Quaker neighbors, a log cabin was erected and the family lived a simple life. Women of this era were always industrious and generally clothed their families by their own handicraft. Bread, milk and pie usually composed the frugal morning meal with good pork or bacon and a wheat flour pudding or dumplings with butter or molasses served for dinner. The evening meal was comprised of milk, butter and honey with mush or hominy. Chocolate was a rarity but sweetening was done with maple sugar. Venison and wild turkey was served in season. Only the wealthiest of farmers had a wagon to go to market. Daniel Boone was the fourth son and sixth child of Squire and Sarah Boone. Born in Oley, then Philadelphia County, Nov. 2, 1734. He was most likely named after Daniel Boone, a distinguished Dutch painter, who died in London in 1698 and to whom the family could have been distantly related. From his infancy, Daniel Boone seems to have possessed to an unusual degree those amiable traits of character that won him the love and esteem of his acquaintances. His uncle, John Webb, was fond of taking him as his house guest with his three sons and daughters as playmates. The sight of Indians must have been among his earliest recollections. The Indians would visit both the Oley and Exeter settlements and were kindly entertained by the Quaker families. It is recorded in the provincial records of Pennsylvania, that in the summer of 1736, the famous old Delaware chief Sassanoon or Allummoppees with several other chiefs young men, women and children numbering 25 altogether arrived at George Boone’s on their way to Philadelphia and were entertained. It was there that they learned of Patrick Gordon’s recent death (he was lieutenant governor of the province). These and similar bands of red men visiting the area must have afforded to the inquisitive mind of young Boone curious and interesting subjects of study and contemplation laying the foundation of his knowledge of the Indian’s character. In October, 1744, Squire Boone took out a warrant for 25 acres of land in Oley five or six miles north of the family homestead. From the age of 10 to 16 years young Boone was constantly sent to watch the herd grazing there. For the first several years he would carry with him a staff made of a small sapling grubbed by the roots, properly shaved down leaving a rooty knob at the end. He called this his herdsman’s club. While attending the cattle, young Boone would creep stealthily upon birds and other small game and throw his club killing the game. He studied all the wild life studiously and within his nomadic early years started to kindle his live of nature in all aspects. When he was 12 or 13 years old, Daniel’s father yielded to his request and purchased for him a short rifle-gun which he soon mastered as both a marksman and hunter. His love for the chase became a passion and much fresh meat was brought home to the Boone family. Often his herd of cattle was neglected and went astray. Daniel Boone never went to school a day in his life (story he is said to have told his own children). When he was 14, his brother Samuel nearly seven years his senior married an amiable and intelligent young lady named Darah Day. She taught Daniel to read and spell a little. He could at first do little more than write his own name in an uncouth and mechanical way. To these humble beginnings he added something as he grew up and went on to even understand the basics of arithmetic. He could eventually read understandingly and write intelligently. Reared under the peaceful influence of the Quakers, he would nevertheless fearlessly maintain his right as he understood them. Squire Boone, in addition to his farming and weaving operations, carried on the smithing business for repairing guns as well as executing the customary work involved with farming. Daniel was set to work in the smithing shop and acquired a mechanical knowledge of what pertained to the gun and rifle. Such was the life of Boone’s boyhood days. Much aided in the foundation of what was to become the later years of this renowned American frontiersman. 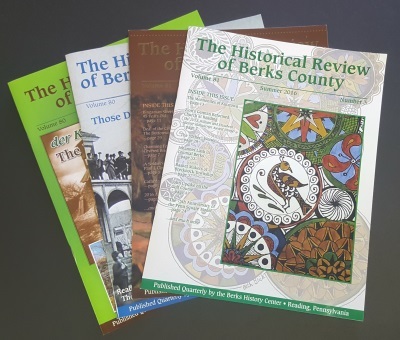 This article originally appeared in the Summer 1989 issue of the Historical Review of Berks County. The Daniel Boone Homestead is located in eastern Berks County Pennsylvania.